This elegant 14K white gold antique style engagement ring mounting features a bold frame of round faceted diamonds with a total diamond weight of .63 carat. 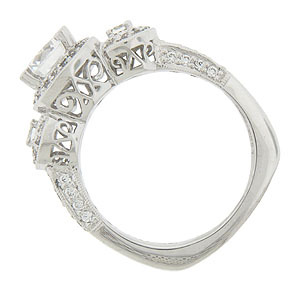 The mounting is designed to hold a 1.0 carat center diamond. The shoulders of the band mirror the central design. 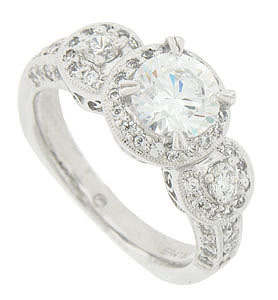 Additional round faceted diamonds and elegant filigree adorn the sides of the ring. The wedding ring measures 9.31 mm in width. Size 6 1/2. 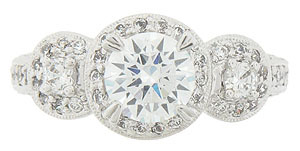 A matching wedding band (WB4130) is available for $750.00 with .39 carat of diamonds. We can re-size or order in other sizes. Shown here in 14K white gold, the ring is also available in yellow gold and platinum. Prices depend on current market value for the precious metal desired. The center diamond is shown for reference purposes and is not included.